It's back to school time! If you've got daughters, they're probably thinking ahead to the outfits they'll be putting together for the new school year. No outfit is complete with accessories! Here's a great project that is easy enough for kids as young as 10. Making these bracelets is a great answer to the last of the, "I'm bored!" moments of the summer! This fun and quick macrame bracelet can be made with hemp or other cord, and Lisa's daughters made theirs using our fancy Crystal Cup Chain. It adds just the right amount bling! Hemp String - the Rainbow Hemp is perfect for younger girls! 2mm Crystal Cup Chain - length needed will depend on the length of your bracelet. You will need as much chain as you have woven part (typically at least 5"). We had a 2 foot section of the chain that we worked right off of and trimmed at the end so there was less waste. Clasp - the video below shows you how to make the bracelet with an adjustable clasp, or you can tie on a metal clasp (if tying on, I suggest using a little glue on your knots). Glue - in the video, she uses nail polish to seal her knots. I like to make it extra secure by using glue. This Hypo Cement glue comes with a tiny applicator needle and works great! Tape - to secure your project to the table as you work. This weave is commonly referred to as Cobra Braid, Cobra Stitch, or Square Knot Macrame. The below YouTube video by simplyDIYs will show you how to do the basic weave. In fact, Julia's whole channel is great; visit her and her fabulous team of crafty ladies at HGTV Handmade. 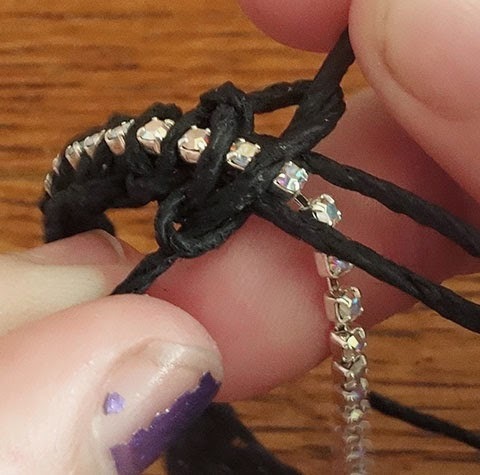 To incorporate the crystal chain, keep the chain above the middle string. In the picture to the right, Lucy has 2 middle strings, in the video she only has one. Either way works fine. Let each knot come up and around the next crystal link in the chain and tie that knot tightly around it.